When European settlers first came to Long Island in the early 1600’s, they found the island inhabited by Native Americans of the Algonquian group, loosely divided into bands, grouped together into a confederacy under the leadership of the Montauk Sachem, who was considered to be the ruler from Montauk to the western end of the island. This chieftaincy was acknowledged both by the Indians and the Europeans as the ruling family of the island. The principal Montauk village, which probably bore the name of the tribe; was about Ft Pond, near Montauk Point. Like the other Indians of Long Island they were closely related to the Indians of Massachusetts and Connecticut. Tooker (Cockenoe-deLong Island, 1596) says that the dialect of the Montauk was more nearly related to the Natick of Massachusetts than was the Narraganset. Prior to contact, the Montauks, like many Native Americans, did not reside in one place but ranged over a territory. What we know about these early inhabitants is meager, since they did not have a written language. They ate abundantly from wild game such as deer and wild birds, from fish and crustaceans, and grew corn, squash and beans, gathered berries, herbs and roots. They hunted whales in canoes and used the entire whale including whale oil, which they burned in large clamshells or rocks. It was the Native American who taught the Europeans how to whale. They built forts, the largest was on the hill where the Montauk Manor now stands. The Montauks waged war with the Pequots and the Narragansetts, however a pestilence ravaged their tribe and by 1659 their population was so decimated that they were forced to seek protection from the “English” against their arch enemies the Narragansetts. Their numbers further declined in 1788 when most of them left Montauk under the leadership of Samson Occum and joined the Brotherton Indians of New York. The few remaining Indians were forced from their land at Indian Field (the current Deep Hollow Ranch) after Benson bought Montauk in 1879. Even though the tribe was eliminated by order of the State Supreme court in 1910, a few mixed blood descendents still live in East Hampton and also in Brotherton. The first European settlers in East Hampton were a group of English men and women who came here from Massachusetts. The settlers purchased land from the Montauk Indians in 1648, which extended from Southampton’s eastern boundary to Napeague beach. It wasn’t until 1665 that Wyandanch, the grand sachem of the Montauk tribe, gave the settlers the right to pasture their livestock on Montauk. In 1686 the Montauk Indians sold Montauk to a group of East Hampton settlers, known as the proprietors, who owned the land in joint trust for almost 200 years. So began Montauk’s history as a summer pasture for cattle, sheep and horses. The annual cattle drives were on May 1 (going on) with a return on November 1 (going off). These annual cattle drives in which some 1200 to 1500 cattle would come from all over Eastern Long Island were a big local event, and townspeople went out in numbers to watch the riders herd their livestock. 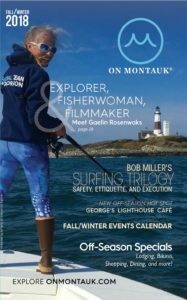 While on Montauk, the keepers guarded the herds. Three houses were built to house them. Except for the lighthouse, they were the only buildings on Montauk until the late 19th century. First House, located just where the hills called the Nominicks rise from the flat plain of Napeague, burned down in 1774 and was never rebuilt. Second House, built in 1797, is now a museum run by the Historical Society. Third House, overlooking Indian Field on the grounds of Theodore Roosevelt County Park, dates to 1806 and is now run by Suffolk County as a museum. The Montauk Lighthouse was commissioned by George Washington and built in 1797. It was a Coast Guard station for many years and its signal light and foghorn warned ships to stay clear of the treacherous rocky shoals that extend outward from the point. The lighthouse is now operated as a museum by the Historical Society and is visited by a million visitors annually. Legend has it that treasure chests of pirate booty are buried in Montauk. Captain Kidd supposedly left two chests of his loot in Money Pond. No pirate loot has ever been found, however in more recent history plenty of loot, in the form of liquor, could be found on Montauk’s beaches. During the 13-year prohibition period, the Rum Runners, as they were called locally, used Montauk as a drop-off place for liquor. Old timers remember signals from ships moored out past the legal limit rousing the men to sea in small boats to bring in the cargo under the cover of darkness. The cargo, liquor, was brought to the sand dunes in small boats, where it was dug into the dunes, to be later picked up and transported to New York City in armed trucks. Began when the heirs of the early proprietors sold Montauk for $151,000 to Arthur Benson who brought out his influential friends and built a few houses at the point. They called themselves the Montauk Association. These houses now enjoy historic landmark designation. Carl Fisher, who purchased Montauk from the heirs of Arthur Benson in 1926, fell in love with Montauk in the 1920’s whose rolling hills with little vegetation reminded him of moorland in England. He built the Montauk Manor, the office building in town, the golf course, the yacht Club, Tudor style homes and even a Tudor village for the workmen in anticipation of a summer playground for the elite. His grand vision of Montauk ended with the Stock Market Crash of 1929, but Montauk’s popularity as a tourist attraction continues to grow. This year the Plaza in the village was renamed the Carl Fisher Plaza in honor of Montauk’s visionary developer. Check out the latest issue here!